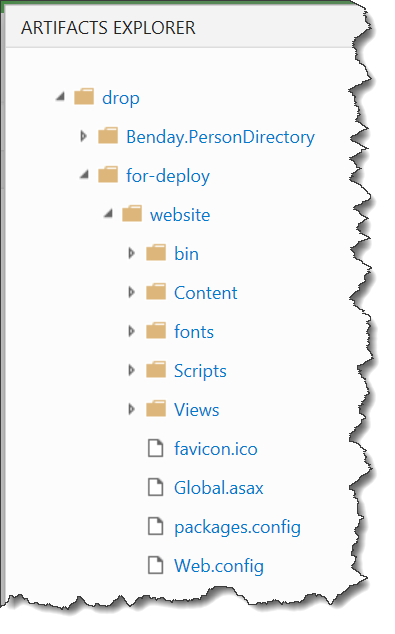 An ASP.NET MVC Site That’s Easy to Deploy from a TFS Build – Benjamin Day Consulting, Inc.
By this point, you’ve probably heard that Team Foundation Server 2015 has a completely new build system. As part of it, it organizese and compiles the code slightly differently than the old XAML-based TFS Build system. First off, when you run a vNext build on a build server, you got four folders: a, b, s, and TestResults. TestResults contains (surprise!) the results of any unit tests that you ran. The “s” directory contains the source code that went into the build. The “a” directory contains the artifacts (also known as the “drop”) that are uploaded at the end of the build. The “b” directory is probably empty. If you’re in a DevOps mindset and you’re trying to deploy an ASP.NET Web Application (WebForms, MVC, WebAPI), you’re probably going to panic when you open up the artifacts directory (“a”) and find everything EXCEPT your web application. If you’re used to doing “right-click deploys” or you’re used to building with the old XAML-based TFS build system, you’re probably wondering where your nice _PublishedWebsites directory is. Life used to be so easy. You used to be able to do a simple copy/xcopy from _PublishedWebsites and you were done. Now that directory’s gone and — well — that’s kind of annoying, isn’t it? There’s a reasonably straightforward fix. Go to your build definition. Click on the Visual Studio Build task. By default, that’s the second task in the list. Next you’ll need to specify some additional parameters for the MSBuild Arguments value for the task. These parameters cause the web project to do a file system deploy that’s pretty much the same thing that it would have done to create that _PublishedWebsites directory. To make your life easier as you get into more and more build and deployment customization, I’d recommend creating a ‘for-deploy’ directory inside of your artifacts directory and putting the published code in that. Here’s the value to paste into MSBuild Arguments. This will publish the website into a directory called “for-deploy\website” in the artifacts directory. After you’ve plugged that value in, save the build definition, and then run a new build. When the build completes, click on the Artifacts tab to view the build’s drop. Remember: this drop directory is the same as the contents of the artifacts directory at the end of the build. Click the Explore link to take a look at the artifacts from your build. You should now see the Artifacts Explorer dialog and if you expand the folders, you’ll see the for-deploy\website directory. Inside of that directory is the published website that’s ready for you to deploy to your web server. I hope that this saves you some pain and frustration. 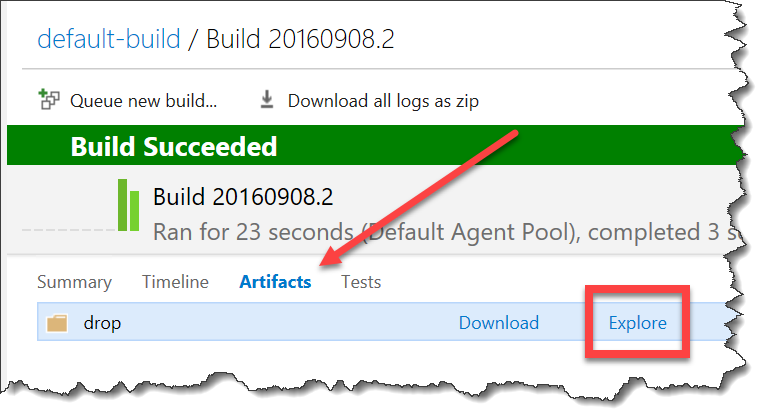 — Looking for help getting going with Team Foundation Server Build vNext? 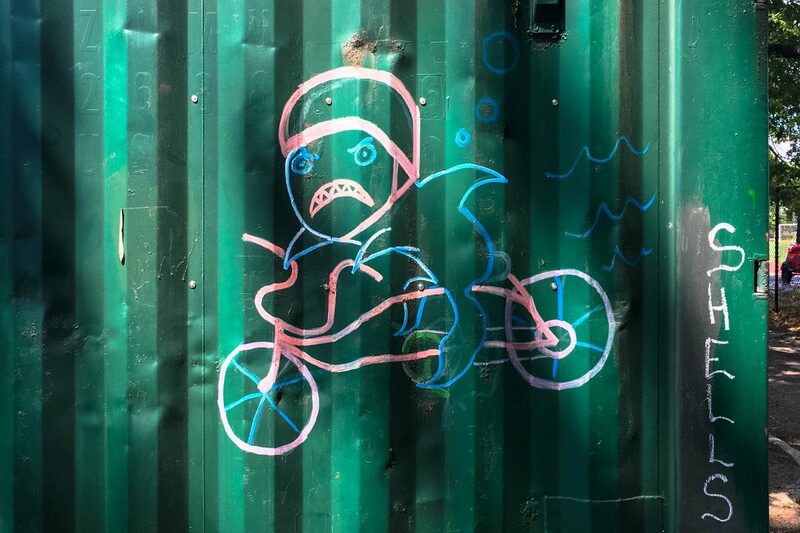 Want to get better at DevOps? Not sure where to start? We can help. Drop us a line at info@benday.com. 12 Responses to "An ASP.NET MVC Site That’s Easy to Deploy from a TFS Build"
Thanks for sharing, how to handle if i have more than one web application projects in my solution? Have you tried it with >1 web project and found that it causes problems somehow? My first thought is that it should work just fine with multiple projects provided that you’ve set the publish options on each web project. how can I do it with .csproj ? I have two web project in one solutions. and only one is being copied. how can I do it for both of them in two separate folders inside the for-deployment folder. NOTE: I am also taking your course on plural sight. absolutely love the way you explain things. I have the same doubt… i have two web project… how can i separate in folders that. Excellent article, I wish Microsoft would document their stuff like this. Being relatively new the deploying web sites via TFS, it would have been nice to add the final release step on how to use the “Windows Machine Copy” task to copy the the code to the web site. Thanks for this awesome article, i have a solution which contains 3 projects ( 2 class libraries and 1 MVC project). I created a build as defined in your pluralsight video and your blog, but i noticed that only the 2 class libraries produces release package but this $(build.artifactstagingdirectory)\for-deploy\website directory was never created neither was it available in the drop artifact. Are you seeing any errors in your log files? I wonder if you’re accidentally doing the deploy out of order. Or maybe you accidentally put the “dotnet publish -o” stuff in the wrong box.